"Have you had Santa Maria-style barbecue before?" our waiter asked the newcomers who were seated at the table next to us at SeaSalt in Huntington Beach. The group of four shook their heads no. It wasn't the first time he encountered newbies. Despite Santa Maria being a mere three-hour drive from where we were, no group he asked that night had any idea what it was. So, just as he did for the previous three parties who said they weren't familiar with the style, he started to tell this new group all about it. It originated in the Santa Maria Valley on California's Central Coast, he said. And the one thing that's special about it, its all-important tenet, is the firewood. 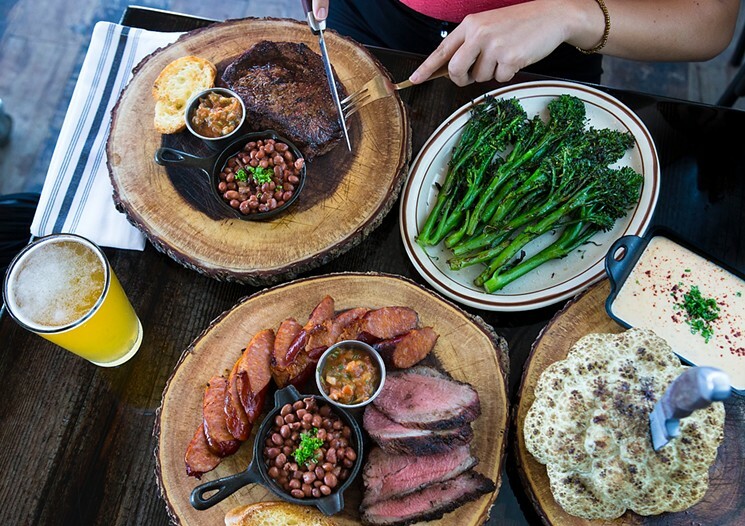 Every slab of meat is cooked over an open-pit fire fueled by logs from native California red oak—the same wood that ranchers in cattle country used to cook feasts for vaqueros more than a hundred years ago. Earlier, when he asked us the same question, my reply was "Yes, we went to Hitching Post II last year." I didn't tell him that its Santa Maria barbecue wasn't the main reason we went. As with a lot of out-of-towners, it was because the film Sideways was filmed there, and I'm a sucker for stuff like that. It did, however, allow our waiter to move on from the basics and talk more specifically about SeaSalt itself, which is former Weekling Alicia Whitney's follow-up to her highly successful SeaLegs Wine Bar across the same parking lot.